A surprisingly empathetic and practical volume, behavioral economist Dan Ariely’s slim, 100-page primer on motivation will be the book you wish your boss had read. Payoff investigates the true nature of motivation, our partial blindness to the way it works, and how we can bridge this gap. 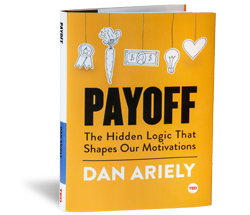 With studies that range from Intel to a kindergarten classroom, Dan Ariely digs deep to find the root of motivation—how it works and how we can use this knowledge to approach important choices in our own lives. The standard assumption is that motivation is based on a simple trade-off: We need and want things, and we work to get these things. The assumption is that we behave just like rats in a maze. But what if our understanding of the way motivation works is all wrong? In this moving, funny, and insightful investigation into an essential human behavior, Ariely argues that motivation operates in far more complex ways than we understand. Delving deep into the true nature of motivation, and our partial blindness to the way it works, Ariely takes us on a journey to try to bridge this gap. From the boardroom to the family dinner table, Ariely gets at the heart of motivation—how it works and how we can use this knowledge to successfully shape our lives. Explore the jungle of motivation's true nature, as well as our blindness to its strangeness and complexity. Rather than seeing motivation as a simple, rat-seeking reward equation, my hope is to shed some light on this beautiful, deeply human, and psychologically complex world. A fantastic peak into Payoff in New York Magazine : "How to Motivate Your Employees: Give Them Compliments and Pizza"
Read the Kirkus Review of Payoff : "Payoff review"
Read why Fortune calls Payoff a must-read book to step up your game at work: "Three New Books to Step Up Your Game at Work (and in Life)"
Dan Ariely is the James B. Duke Professor of Psychology & Behavioral Economics at Duke University. He is the founder and director of the Center for Advanced Hindsight, co-creator of the film documentary (Dis)Honesty: The Truth About Lies, and a three-time New York Times bestselling author. His books include Predictably Irrational, The Upside of Irrationality, The Honest Truth About Dishonesty, and Irrationally Yours.